What Is Freedom? | Do You Think Free? For one to be free they must be independent. This means being responsible for ones own well-being. Freedom is the ability to make your own choices, but also includes owning the results. Many people have an lopsided concept of freedom and want to be able to do whatever they desire without consequences. This is not reality, but is a popular attitude in today’s society. Freedom involves thinking independently. This means taking all the available data and using it to form opinions. If you exclude facts that don’t necessarily agree with your preconceived notions then you are cheating yourself and increasing the risk that you will make good decisions. For instance, if you choose to ride a motorcycle without wearing a helmet, you know you are taking a greater risk of head injury or death in the event of an accident. The choice is yours. The expense of medical care should be yours as well if you get hurt. Freedom is being able to act on your decisions without encumbrances. Take note that this does NOT mean without consequences. Every action has an equal and opposite reaction. The choices you make and the actions you take will have an effect on you and probably those around you. Being free means you are responsible for your actions and the impact they have. Freedom is being able to keep the fruits of your labor. If you grow a garden, you get to keep the produce. It is much the same with every endeavor you engage in. A free person will contribute to society and be compensated for the contribution. The payment will be commensurate with the value of the effort, not higher and not lower. If you choose NOT to work, don’t expect others to feed, clothe and shelter you. A free minded person will not TAKE something they did not EARN as that would be denying someone else’s freedom. Freedom is being able to live by your own values, religious beliefs and ideals. It is also allowing others the same choice. Even within the same religion we all have a personal concept of belief. To force our values on someone else is to deny them the same freedom that we expect for ourselves. This does not mean that if someone else thinks that murder is okay that we should do nothing. On the contrary, acts that infringe on other’s freedoms should never be tolerated in a free society. In fact as free individuals we have a duty to preserve the rights of ourselves and others, even if they do not agree with our ideals. You may be coming to the conclusion that freedom is a complicated and delicate balancing act. Anything worth while takes work to maintain. Liberty is no exception. In fact, it is extremely difficult to retain and easily lost. Many are willing to trade their freedom for convenience, to allow others to make decisions for them so that they are not held liable for the results. But this, too, has a ripple effect on our society as the cost of dependency is born by all who strive to be free. So perhaps we should train ourselves and our children to think more independently and to value the liberty they have. Perhaps we should work to regain the freedoms we have given away in exchange for leisure and the delusion of security. Perhaps we should all make the commitment to be responsible for our own fate. After all, Freedom is an action, not just a state of mind. p.s. 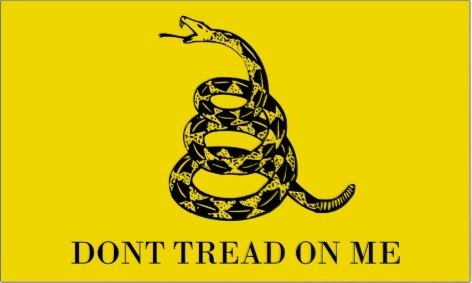 I used the image of the Gadsden Flag because it stands for Freedom. The rattlesnake was chosen for this flag because it is an honorable creature. It lives independently. It does not kill for sport, only for food or when threatened. It warns before it strikes, giving an attacker a chance to retreat, but it does not back down from an attack. This was the concept of the Colonists who used this flag as the first USA naval flag. The same holds true today.